LUCENA CITY – Quezon province is one of the 17 among 81 provinces in the whole country that bagged the coveted Seal of Good Local Governance (SGLG) award this year given by the Dept. of Interior and Local Governments annually to local government units showing excellence and public responsiveness. Quezon and Laguna are the only provinces in the CALABARZON Region 4-A which got the award. The other provinces include Ilocos Sur, La Union and Pangasinan in Region 1; Isabela and Quirino in Region 2; Bataan, Bulacan, Nueva Ecija and Tarlac in Region 3; Camarines Norte in Region 5; Aklan, Antique and Iloilo in Region 6; Cotabato in Region 12; and Basilan in the Autonomous Region in Muslim Mindanao. Quezon Gov. David ‘Jayjay’ Suarez received the award given on Nov. 7 at the Manila Hotel along with 4 Quezon mayors who also got the same 2018 SGLG award for the towns of Gumaca, Mauban, Panukulan and San Antonio. 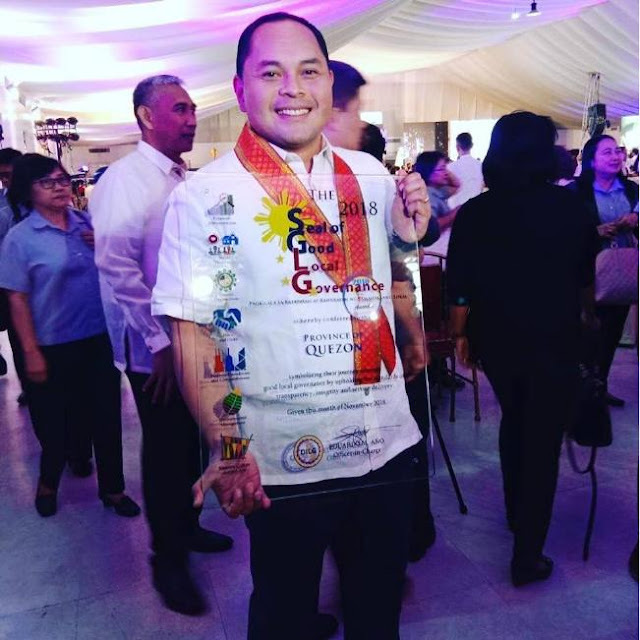 Suarez said the award is for all the Quezonians who have all been doing as good and law-abiding citizens for the province and without whom the award would not have been possible. Last year, Quezon was also recipient of SGLG award along with Laguna and Rizal among 28 provincial government awardees. According to Quezon provincial planning and development coordinator Odessa Perez, the SGLG award covers 4 major components which include financial administration, disaster preparedness, social services, peace and order and for this year the award added the 4 sub-components which the previous years include only one: business friendliness and competitiveness, environmental management; tourism, culture and the arts and test of results-acceptability. The last means that at least 10% of its component cities and municipalities are 2018 SGLG passers. SGLG aims for the local government units in the whole country to foster transparency and accountability, prepare for challenges posed by disasters, broaden access to social protection services especially the marginalized sector, attract more business opportunity, protect the community from threats to life and security, uphold environment and optimize tourism potential and enrich cultural heritage.